I'm going to take Ron Schock with the 1st pick of the 6th round. From what I've been able to gather, he was Jordan Staal before Jordan Staal. Tied with his teammate Pronovost with 14 SHG with the Penguins. 619 games played, good for 6th in Penguins history. 404 points in 8 years with the team. Also, can anyone recommend a good site to find info on defensemen? Hockey-Reference isn't doing it unless I want to sit there and filter through every.single.year. I imported either the table from hockey reference or hockeydb and have two lists. One of all skaters and one for just defenseman. No idea if there is just one source for it anywhere else. Has quietly turned himself into a solid defenseman. Not a scorer, but his physical presence and good defensive play make him my choice here. nhl.com has franchise stat lines for all Pens players. Schock will be devastated to learn that he's a Penguin again. Well, the team I initially drew up was torn to shreds. I was pretty sure I was going to get away with getting Ron Schock at least. Excellent pick,. The Selke Trophy wasn't created until 1978, so Schock kind of misses out there, but yes, he was Jordan Staal with better playmaking, not quite as good goal-scoring. Excellent PKer, PK specialist some might say. I'll go with my backup plan here...a terrific top-2 centerman for us for a number of years for us, 14th still in points in our history, could play PP with his great playmaking ability and fine scoring touch or PK with his team-first attitude. Is that 3 centers for you monsieur mikey? Ah ok. Hey mikey can you throw meow's google docs thing on the first page too? It nicely color codes everything for me and that way its in a nice, easy, accessible spot for everyone. Rylan wrote: Ah ok. Hey mikey can you throw meow's google docs thing on the first page too? It nicely color codes everything for me and that way its in a nice, easy, accessible spot for everyone. What Errey lacked in size, he made up with his speed, tenacity, and character. Errey was a versatile, dependable player on both sides of the ice and also served as an alternate captain for many years. 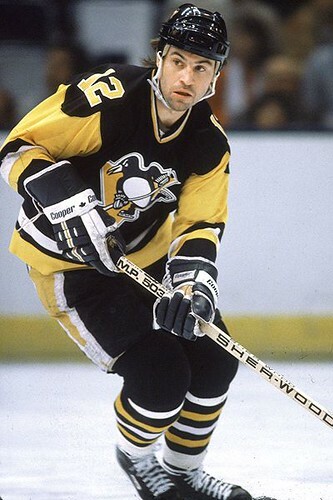 While not spectacular, his offensive output was nothing to sneer at either, scoring 26, 20, 20, and 19 goals in consecutive seasons for the Pens. 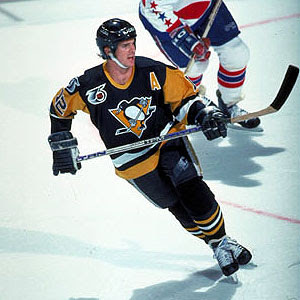 Overall, he appeared in 572 games for the Pens (9th all time), scoring 132 goals and adding 140 assists. Changes at any time can be posted or PM'd - though, I'm not sure why they're secret, but they certainly can be. Be mindful of power play and penalty kill units when the time comes. The Kings are strong down the middle. Damnit, I was hoping Errey was going to drop. Yea I was hoping he would fall to the later rounds. Oh wells. No one's picking the guy I would have taken already. I won't say who. Sarcastic wrote: No one's picking the guy I would have taken already. I won't say who. I have a couple guys I would want to pick right now. We'll see how it works out. Yea my draft board is completely full still.